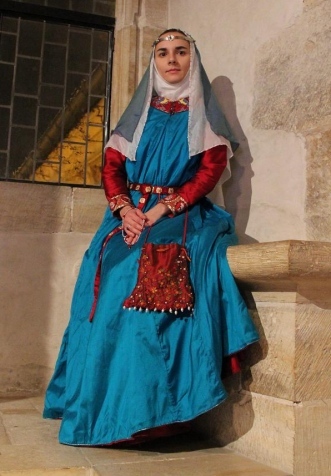 Clothing of Noble lady at the beginning of 14th century in Western Europe. It consist of red silk cotte and blue silk surcotte. The surcotte is lined by woolen fabric. The neck-opening and sleeve edges are decorated by embroidery which can be seen in next pages. Important part of entire outfit is also silk purse with embroidery and the belt.